In spite of his name, Mino da Fiesole (1429–84) was actually born in the Tuscan town of Poppi, and was taught his craft by Desiderio da Settignano. He made his name for one of his earliest works, the fine altarpiece and tomb of Bishop Leonardo Salutati, in Fiesole cathedral. 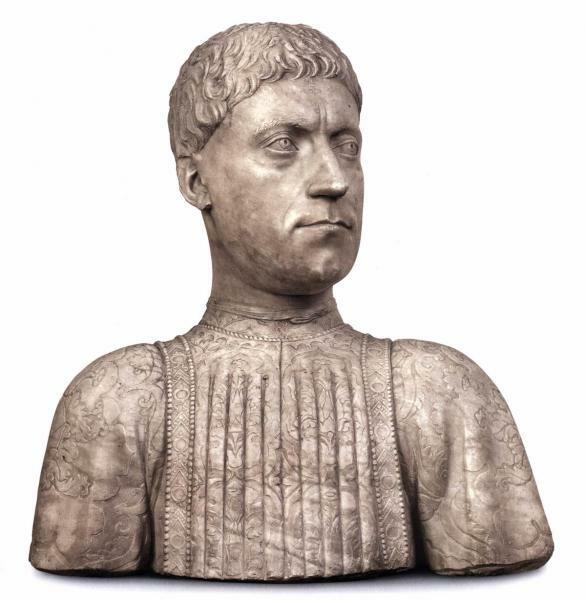 Like the della Robbias, Mino was a representative of the Florentine ‘sweet style’ and soon became well known for his delicate touch and expressive marble portraits; his Portrait of Piero de' Medici, father of the Magnificent Lorenzo in the Bargello is believed to be the first marble bust sculpted from a living figure since antiquity. Although he spent at least six years working in Rome and often worked with others, making attributions difficult, he also gets credit for the beautiful reliefs and tomb of Count Ugo of Tuscany in the Badia Fiorentina. He is buried in Sant’Ambrogio near his exquisite Tabernacle.